Situated on the edge of a spectacular harbour, encircled by green, towering hills, Wellington is a stunning and compact city. Vibrant, exciting and cultured, New Zealand's capital combines the stimulation and sophistication of a big city with the charm of a village. With over 50 museums and galleries, three professional theatres and headquarters for the Royal New Zealand Ballet and New Zealand Symphony Orchestra, Wellington can truly lay claim to the title Arts and Cultural Capital. 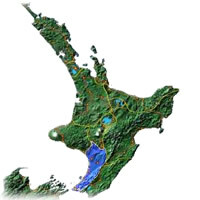 The greater Wellington region spreads from the bottom of the North Island up the west coast. Wellington is also named the windy city, so avoid the umbrella and wear a hat on a wet day! Adrenalin Forest is best described as a multi level aerial obstacle course. Participants negotiate a series of rope bridges and flying foxes constructed in the tree canopy. The park features an aerial obstacle course up to 30 meters off the ground, 6 pathways of progressive difficulty. Experience a taste of warm 'kiwi' hospitality when you cruise Cook Strait with the proudly New Zealand owned Bluebridge service. With stunning scenery, friendly service, free big screen movies and a choice of up to four return sailings a day between Wellington in the North Island and Picton in the South Island – there's no better way for you and your vehicle to cross Cook Strait. Beautiful Old St Paul's is like a book. Its stories are told not in words but in wood, metal and glass. Constructed entirely from native timbers, the glowing interior is enhanced by stunning stained glass windows. Social history comes to life in this former cathedral church. We offer comprehensive guided tours to the public and to tour groups. Entry by donation. Tours $5. Within the walls of this historic 1892 waterfront warehouse is a world class museum that celebrates Wellington's intriguing history. Highlights include a film depicting a century of life in Wellington told through the eyes of Wellingtonians, a show depicting Maori creation legends, and the Wahine Disaster Gallery. Only a short 15 minute drive or train ride from Wellington, the Hutt Valley is home to adventurous activities, a rich culture and heritage, and beautiful scenery. From the Hutt River to the bush-clad hills, explore some of the Wellington's best walking and mountain bike trails. Add in picturesque townships of Petone and Eastbourne, and a bustling collection of art galleries, cafes and restaurants. Zealandia provides a unique experience to see native and endangered New Zealand wildlife in a protected and natural habitat. The goal of the Zealandia sanctuary is to create a predator free zone for native wildlife to flourish in a pre-human like environment. See exquisite birdlife, reptiles and kiwis in natural surroundings and take part in family fun exhibitions and activities. Let's go to 25 Tinakori Road, in the historical area of Thorndon and visit the birthplace of Kathryn Mansfield (born in 1888). She is the most famous New Zealand woman author. Visit the botanical garden of Wellington, take a look at the city from the top and enjoy the ride in the red cable car. BrewDay has a new home and a new venue - May 2019 at Brewtown. May's Craft Beer Festival. Keep checking for details at the website. Come and enjoy our Sunday Funday at Basement Bar! Hospo Night! Free Pool Table, free Beer pong Table, $1 Chicken Nibbles and -25% off our selected top shelf all night long! Fresh, free, live music from Wellington's finest musicians - every Saturday Arvo at The Cross. Check out www.thecross.co.nz/whats-on for this week's lineup.